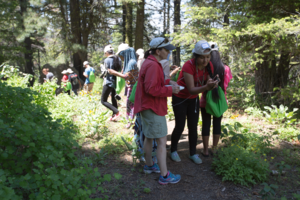 The New Roots Program is a place-based education experience that connects refugee and immigrated children to the community and the environment, making them stakeholders in their new homes. 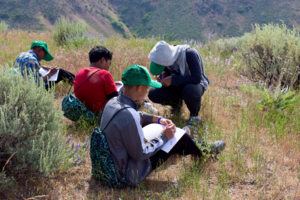 We achieve this by offering a completely cost-free, two-week long summer camp for these youth in the Boise area. This program is lead by the Golden Eagle Audubon Society and is supported through collaboration with many of the Treasure Valley’s many nonprofit environmental organizations and area agencies, especially our partners at the Boise National Forest. The Program is now in its fourth year, and we are proud of the thousands of contact hours experienced with more than 55 youth. Please help us in our effort to keep this program running! This program is funded primarily through educational and environmental grant funding and through the contributions of caring individuals like you! For more information please visit the Golden Eagle Audubon website (http://www.goldeneagleaudubon.org/New-Roots-Program) or find the New Roots Program on Facebook (https://www.facebook.com/NewRootsProgram). The Golden Eagle Audubon Society (GEAS) is dedicated to building an understanding, appreciation, and respect for the natural world in order to conserve and restore natural ecosystems for birds and other wildlife. We believe people protect what they love, and that a love for wildlife and the environment comes from being able to experience, enjoy, and learn about it first hand. Free Birding Field Trips: Birding field trips are the heart of Audubon, and we offer trips for all age groups and abilities. We take full day birding trips to the regional Wildlife Management Areas, Sage Grouse Leks, Bluebird Trails, Intermountain Bird Observatory’s fall migration station on Lucky Peak, and local Reservoirs. We also have urban birding trips along the Boise River greenbelt and in our local parks, which includes a Family Bird Walk that takes place 2nd Sunday of each month. This 2 hour birding trip aims to get families and children outside and enjoying wildlife. Monthly Presentations: Our monthly presentation, on the 4th Tuesday of most months, provides the community with a chance to come and enjoy a presentation on a variety of bird related topics. We often arrange to have local birders share their favorite birding places or experiences, biologists talk about their research, or natural resource professionals update us on wildlife and land management projects. 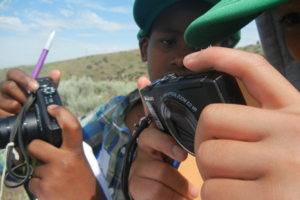 Bird-by-Bird Program, providing Natural Resource professionals an avenue to teach about birds in local schools. Conservation Programs and Advocacy: Our conservation programs aim to engage the community in regional bird and bird habitat conservation. We initiated the creation of Blacks Creek Bird Reserve, an Audubon Important Bird Area. Blacks Creek Reservoir and the nearly 600 acres surrounding it, serves as crucial habitat for over 150 bird species, but was misused and treated as a dumping ground for years. In 2007, GEAS organized cleanup events and formed partnerships to begin the process of protecting this unique place. Blacks Creek Bird Reserve is now protected from further habitat degradation and we host ongoing restoration events to improve wildlife habitat on public lands at Blacks Creek Bird Reserve. 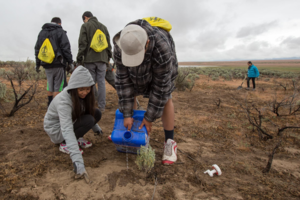 Future conservation efforts aim to expand our work at Blacks Creek to adjacent desert reservoirs and improve habitat in our urban areas, through native and ecological landscaping workshops. In addition to on the ground and community conservation programs, GEAS advocates for conservation issues that affect our local bird populations and their habitat. We support management and conservation initiatives that improve habitat and sustain populations. If needed we oppose actions that are not in line with our mission and degrade the natural resources that are important for conservation. Citizen Science: We support citizen science projects, such as monitoring of area Bluebird nest boxes, and organizing Christmas and Great Backyard bird counts. Small Grants: We support grassroots education and conservation projects through a small grants program. This year we gave over $2000 to local projects and research. Your support allows this 100% volunteer organization to provide so much to our community and the environment.